Ashfield’s residents could enjoy two hours of free parking in the district’s busiest car parks under new plans put forward by the council. If Ashfield District Council’s cabinet approves the motion next week, 10 per cent of bays at the three most used car parks will receive two hours of free parking. Hodgkinson Road car park, Kirkby. Bays at Sutton’s Market Place, the Hodgkinson Road car park in Kirkby and in Piggins Croft, Hucknall, would see the changes. Residents can already enjoy one hour free parking in these sites and now the council wants to reward residents introducing the extra free hour of parking. The remaining 90 per cent of bays will stay at one hour for free. 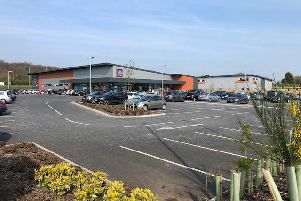 A council spokesman said: “The introduction of two hours free car parking will follow on from the success of the free weekend parking during December. If approved, Cabinet will regularly review the success of the free parking bays. There are also plans to add 11 electric vehicle-charging points to public carparks across the district. The rapid charging points charge vehicles in around 45 minutes, allowing drivers to charge their vehicles whilst enjoying the districts town centres and outdoor space.